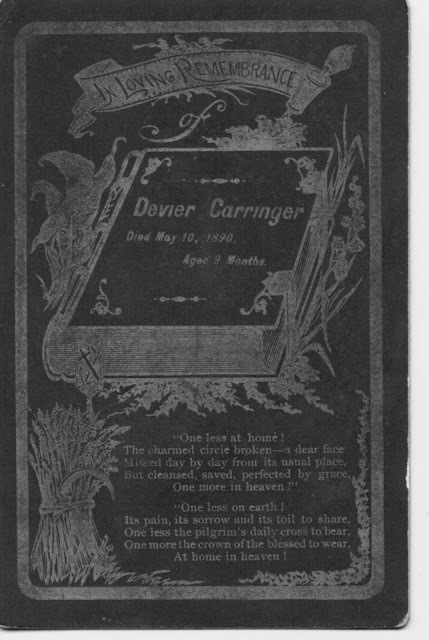 Devier Carringer memorial card, in Carringer Family papers collection, May 1890, privately held by Randall J. Seaver, [address for private use], Chula Vista, Calif.. black card with gold printing, includes a poem. passed from Henry Austin Carringer to Lyle L. Carringer (1946) to Betty (Carringer) Seaver (1977) to Randall J. Seaver (2002). Devier David Carringer was born on 19 August 1889 in National City, California, the first child of Henry Austin and Abbie Ardelle "Della" (Smith) Carringer. He died at age 9 months and was buried at La Vista Memorial Park in National City. His name was taken from the first names of his grandfathers, Devier Jame Smith and David Jackson Carringer. Can you imagine losing a 9 month old child? I cannot, and yet events like this happen that affect a person and a family for the rest of their lives. Austin and Della had another son, Lyle Lawrence Carringer, my maternal grandfather, on 2 November 1891, and by family accounts, over-protected him during his childhood. Family accounts also said that Austin and Della renounced their Christian faith because of Devier's death.